This lounge is located across from Gate 26 in the domestic side of SCL. For being a domestic airport lounge accessible via Priority Pass, it’s actually quite nice. Unfortunately, there’s no elevator up to the lounge, so you do have to climb a flight of stairs. The lounge itself is a smallish room with a skylight. But in spite of being pretty small, they cram in a lot of seats and partitions to give a decent sense of privacy. The lounge also was not very crowded while I was there, which helped. The buffet is pretty decent for a domestic lounge. I was particularly surprised to see sushi (I was not brave enough to try it). I mostly just ate almonds and granola. There’s also a full-service bar. In terms of being a good place to work, there were a fair number of outlets, and the wifi was decent. There’s also a small play area for kids, a shower (although it was “occupied” the whole time I was there), and a very small conference room (which was occupied by someone who I believe worked for the lounge the entire time I was there). Overall, a very pleasant domestic lounge. This entry was posted in Lounge Reviews, Travel, Trip Reports and tagged airport lounge, lounge review, priority pass, scl, travel, trip report on May 21, 2018 by Edward. I visited this Aeromexico lounge first during my layover since I was flying Aeromexico. When I arrived at 6am on a Friday, the lounge was quite crowded with most seats taken, although it cleared out a bit within 15 minutes. The lounge is essentially a larger room with a smaller offshoot. It’s honestly tiny given that MEX is a hub for Aeromexico. Similar to US domestic lounges, it honestly doesn’t offer much to passengers. The food options for breakfast were not great. A couple of pastries, fruit, yogurt, and cereals is all you’ll get. I did like that they had papaya, though, as at least it’s better than the sad melon melange you usually find in US lounges. The other thing I liked about the lounge (there honestly wasn’t much) was that they had a whole bunch of coconut water. Perfect after a dehydrating flight. Aeromexico also offers coconut water in flight (and there were ads played on my flight for the brand that they carry). All in all, not a lounge worth visiting. This entry was posted in Aeromexico, Lounge Reviews, Travel, Trip Reports and tagged aeromexico, airport lounge, lounge review, mex, travel, trip report on April 30, 2018 by Edward. The Amex Centurion Lounge in the Mexico City Airport has been recently renovated and reopened. This lounge is accessible to those with an Amex Platinum or Amex Centurion credit card. There are Centurion lounges in both terminals, but this review is for Terminal 2. The design of the renovated lounge reminds me of the Centurion lounges in the U.S. It’s pretty spacious with lots of different seating options. 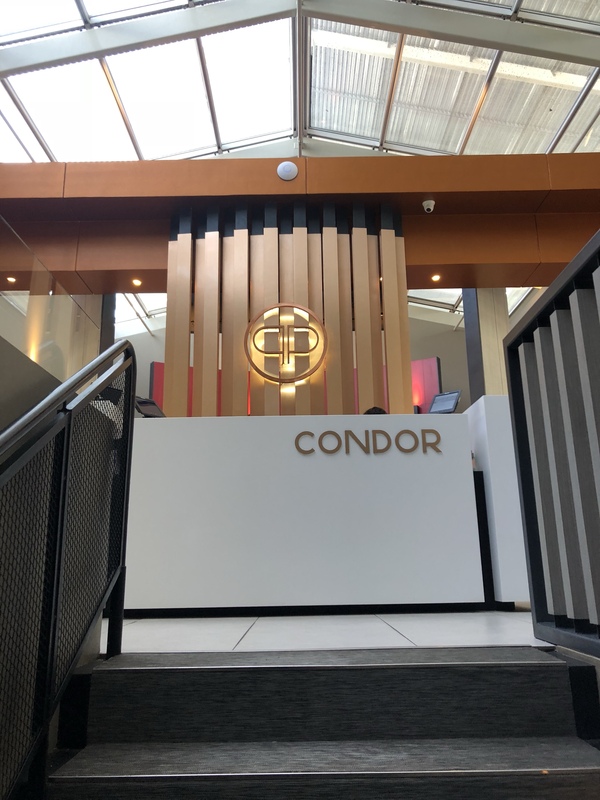 There are two floors to the lounge: upstairs, you’ll find the spa (and shower room), dining room, and tables; downstairs you’ll find a cafe/bar area, a small children’s area, and couches. There’s also a zen room tucked away (with a separate staircase from the rest of the upstairs). Centurion cardholders have access to a separate space. Nothing is self service in this lounge, which means service can be slow(ish). There’s also potentially a language barrier (I am to blame for not speaking Spanish). But the hosts were generally attentive in offering drinks and food. One thing that’s different about this lounge from Amex lounges in the US is that a lot of the food and drinks appeared to require payment. I was given a laminated card that said I was entitled to some food, but they have a more extensive paid menu of food options. Overall, it’s probably the nicest lounge I visited in MEX in terms of sitting (although it did get quite crowded by the time I left), but I’m not a fan of the weird a la carte menu. This entry was posted in Lounge Reviews, Travel, Trip Reports and tagged airport lounge, amex, lounge review, mex, travel, trip report on April 23, 2018 by Edward. The Dan Lounge at TLV is accessible via Priority Pass (there are actually two of these lounges in different parts of the airport). There aren’t very many airport lounges at TLV, which is why I think this lounge was so crowded when I visited. Tons of people, to the point where I had to wait a little bit to find a seat. It’s also not a huge lounge–it’s just a long rectangular room–given how many airlines it’s serving. The food options were not that extensive when I visited. There were a bunch of breads/pastries/cereals, there were a couple of cold foods like salads and yogurt, and that was about it. I had some oatmeal, which was about the only hot food I could find. 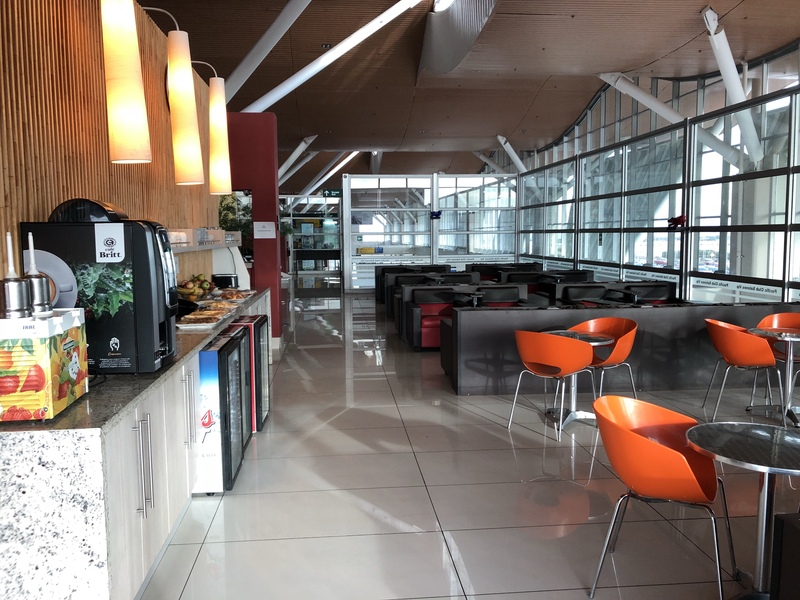 All in all, it might be marginally better than waiting in the terminal, but given how crowded the lounge was and the poor food options, this lounge isn’t really worth a visit. This entry was posted in Lounge Reviews, Travel, Trip Reports and tagged airport lounge, lounge review, priority pass, tlv, travel, trip report on February 22, 2018 by Edward. Over the summer, I took a short trip to Jordan from Israel. On this trip, I stayed at the Seven Wonders Bedouin Camp near Petra. The camp is pretty large. I was on a decently-sized tour (~30 people), so it’s not some boutique experience, even if you stay at this place yourself. That being said, it was pretty cool to stay out in the dessert, and the views were great. The tents are pretty basic. Just two beds with lots of blankets. I was there in July, so it was pretty warm and toasty most of the time. There is some electricity in the tents, but it cuts out pretty early in the evening, so you can’t charge things overnight. The tents also don’t have locks on them, except from the outside, so it’s actually possible to lock your companion into the tent. Make sure to bring ear plugs, as there’s very little noise insulation. That being said, because we were hiking in Petra all day, I slept pretty well. There are communal bathrooms with hot running water. You should probably bring flip flops/shower shoes of some sort. Also a flashlight/your phone to get to and from the bathroom at night. It is in the middle of the desert, so they have to get water delivered, so sometimes, there wasn’t any water. So you might want to wake up early to make sure you can use the bathroom before the water runs out if the camp is crowded! We had breakfast and dinner at the camp. This was just buffet style food. The food was fine, but you’re not staying in the desert for the food. The best part of the camp was the fire pit. A huge circular are with lots of pillows and blankets to chill after a day of hiking in Petra. There was tea and hookah available (and wifi! albeit slow wifi). Would I stay here again? Sure, if someone else wanted to. It’s an interesting and kinda fun experience. It’s not really camping, and it’s not really a cultural experience, but it’s an easy, decently comfortable way to spend the night in the desert. This entry was posted in Travel, Trip Reports and tagged jordan, travel, trip report on February 21, 2018 by Edward. Although I’d flown Cathay Pacific long-haul multiple times, this was actually my first time flying them long-haul in business class. My initial impressions of the cabin were not great. The cabin did not seem to be adequately cleaned before the flight, and some things seemed to be falling apart. Part of the armrest was coming off (and you could see wood underneath), there was a napkin left at my seat, there were stains, etc. It seemed like the plane needed a little love. I was seated in the mini-cabin right behind first class. This is just two rows of business class, so it feels pretty intimate and private. The bulkhead also has additional foot space since it’s the bulkhead. There was a pillow, blanket, and headphones already at the seat, and the flight attendants came around offering pre-departure beverages. In spite of my quibbles about the cleanliness of the cabin, it’s still an awesome hard product. There’s space to put things under the ottoman, there’s a shoe compartment, storage on the side, counter space, etc. The seat goes lie flat and has good privacy, and it feels plenty wide. This flight was catered as supper, snack on demand, and then breakfast prior to arrival. I’m not sure why they serve breakfast prior to arrival as the flight lands at 8pm. While the more typical lunch and dinner menus often have one vegetarian option, there was very little vegetarian food on this menu, so make sure to order a special meal if you’re a vegetarian on a supper flight. For my supper meal, I had pre-ordered a Jain vegetarian meal. The VJML supper consisted of a cold, spicy chickpea salad, fruit, rice, lentils, okra, and green beans. Pretty decent for a special meal. After supper, I slept for about five hours. The seat was super comfortable, and the blanket was large and not too hot. Breakfast was served prior to arrival. I started out with fruit and bread. One thing I noticed was that the VJML fruit plate was different from the fruit plates that other people were getting–not entirely sure why since fruit is obviously vegan. After fruit and bread, people were offered cereals and yogurt. For my VJML entree, it was a main of Indian breakfast items. I honestly can’t believe it was meant to be served as I received it, since there was very, very little curry in the container. It looked like the curry had spilled out of the container, but there was nothing to replace it, so it was mostly just white carbs. Overall, I was a little bit disappointed by this flight. While Cathay Pacific has a great hard product and can sometimes have amazing service, the service on this flight wasn’t very good. The service felt cold, I wasn’t welcomed on board, I was never addressed by name, etc. Heck, I’ve been addressed by name flying economy class on Qatar (and on Cathay for that matter). 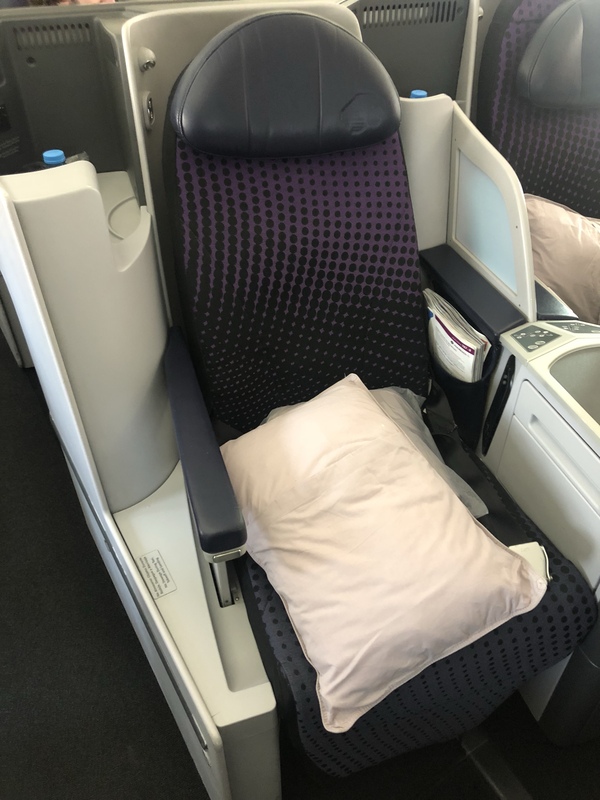 This entry was posted in Cathay Pacific, Travel, Trip Reports and tagged business class, cathay pacific, flight review, travel, trip report, vjml on February 20, 2018 by Edward.